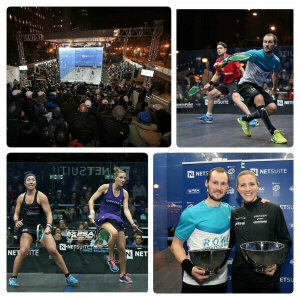 Top seeds Gregory Gaultier and Laura Massaro claimed trhe titles in San Francisco, Gaultier beating wildcard James Willstrop in straight games while Massaro beat defending champion Amanda Sobht in four. Home favourite and defending champion Amanda Sobhy recorded her first win over Nicol David to reach the women's final, where she will face Laura Massaro, while top seed Gregory Gaultier beat Marwan Elshorbagy 3-1 and wildcard James Willstrop beat qualifier Diego Elias in straight games to advance to the men's final. With one women's semi played today it was top seed Laura Massaro who booked her place in the final - and a day off - with a straight-game win over Joelle King. Earlier, in the first of the day's men's quarter-finals, wildcard James Willstrop came from two games down to beat Simon Rosner. Then in the battle of two qualifier it was Peru's Diego Elias who came through in straight games against Grégoire Marche. The top four women's seeds are through to the semis in San Francisco, while Gregory Gaultier and Marwan Elshorbagy are set to meet in the first men's semi. Round one in San Francisco saw two big upsets in the men's draw as Diego Elias came from two games down to beat Al-Ahram finalist Ali Farag, while in-form Frenchman Gregoire Marche stunned second seed Nick Matthew in straight games. Both qualifiers, theyll meet for a place in the semi-finals. The other upset came in the last match of the day - relocated to the Bay Club - as wildcard [?] James Willstop beat third seed Miguel Rodriguez in straight games. No surprises in the women's draw with all eight seeds through to the quarters. The main draws were completed with qualifying finals at clubs around San Francisco. It was a bad night for the British men as Greg Marche, Diego Elias and Abdulla Al Tamimi all beat higher-ranked Brits, Swiss Nicolas Mueller claiming the fourth spot. The women's spots were takes by Fiona Moverley, Samantha Teran, Sarah Cardwell and Low Wee Wern. 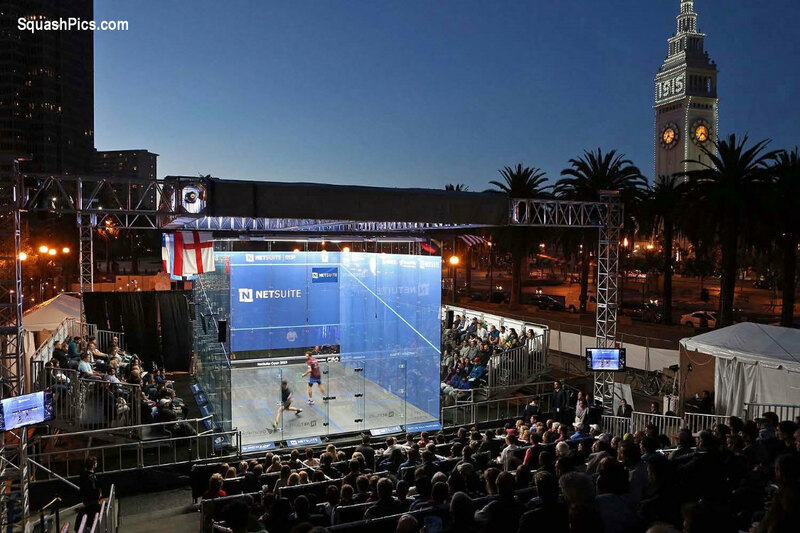 Top squash hits San Francisco for the fifth year in a row as the 2016 edition of the Netsuite Open, featuring Men's $100k and Women's $50k events, comes to town. After qualifying and round one at various local clubs, there will be five days of play on the Glass Court on the South Lawn of Justin Herman Plaza. Top seeds in the men's draw are Gregory Gaultier and Nick Matthew, while the women's filed is topped by Laura Massaro and Nicol David, all of whom will be keen to make their mark in advance is the Delaware Investments U.S. Open which kicks off in Philadelphia shortly afterwards.